Feel like broadening your intellectual horizons and loading up on some serious leadership skills? The Students 4 Students National Leadership Conference is a two day educational extravaganza hosted by the Australian Student Leader Association (ASLA). Throughout the conference you’ll have the opportunity to learn from nationally and internationally acknowledged speakers through several keynote presentations and interactive workshops. This annual conference aims to inspire students to pursue their dreams and aspirations, as well as challenging them to face the contemporary issues of today by igniting the passion and courage necessary for social change. Your ticket gains you access to all four spoken seminars plus your choice of four stimulating workshops covering topics from social entrepreneurship to well-being. Lunch is included and the pièce de résistance is a premier gala cocktail event where you’ll have the opportunity to network with speakers, local industries and businesses, passionate student leaders and key community members. Spring is the season for festivals, and the Surry Hills Festival is not one to miss. The day will be packed full with delicious food by local eateries, a massive themed picnic, fresh produce, market stalls, live music, entertaining performances, art installations and historic guided tours. This year’s event continues the 14-year tradition of unearthing stories from the Sydney suburb’s rich history, such as the runaway elephant on Crown Street and the criminal gangs of Frog’s Hollow. Funds raised throughout the festival will go towards community programs at the Surry Hills Neighbourhood Centre, an organisation providing services to low-income and marginalised groups such as the elderly, the homeless, people with social anxieties or mental illness, and those from culturally diverse backgrounds. Recapturing the roots of Cirque Du Soleil, KOOZA returns to the tradition of combining astonishing acrobatic performances with the masterful art of clowning. 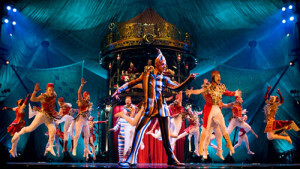 In true Cirque Du Soleil fashion this show explores the themes of fear, identity, recognition and power. KOOZA tells the story of an Innocent’s journey as he comes into contact with comic characters from an electrifying world full of surprises, thrills, audacity and total involvement. Whether you’re taking your kids out for adventure, or your loved one out for a night of romance, it’s safe to say they won’t be disappointed with the intoxicating music, extraordinary costumes and death-defying feats of human strength. Orange is fast becoming known as one of Australia’s most exciting food and wine destinations. To celebrate this fantastic achievement over 20 premium cool-climate wineries, local foodies and tourism providers will be showcasing their wares at Martin Place, giving city slickers a little taste of Orange. Entry is free, with wine tastings and food available for purchase at the event. 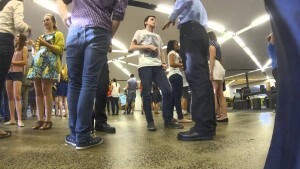 Tastings will be a standardised price of $8 per full glass (120ml) and $4 per half glass (60ml) of wine, beer or cider. Newtown’s favourite cheese purveyors, The Stinking Bishops, will also be there on the night serving the Mac n Cheese you didn’t know you needed in your life. Take a trip outside your comfort zone and become part of a living art installation as you join 400 others in a 3-course meal had in total silence. That’s right – the big finish to the Sydney Fringe Festival is a deliciously absurd social gathering without words. This the perfect opportunity to have an experience unlike anything you’ve had before (and be part of history). 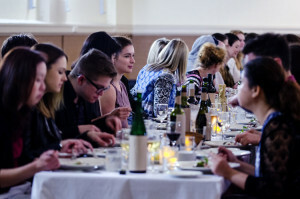 Last year’s dinner completely sold out, and participants have said they were surprised at just how fun and intimate an evening of silence could be. Grab your tickets before they sell out!